For a couple years when Mike and I were little kids, my mom went to night and summer school, wedging in courses to wrap up her master’s (in between teaching and, you know, momming). Once a week or so, then, Dad would be in charge of dinner. Forty-five years later, he’s an accomplished sous to an accomplished home cook, but at the time, his repertoire was rather small: a rotation of pancakes, fried-egg sandwiches, spaghetti with meat sauce (that I’m sure – no offense, Pop – Mom made ahead of time), sloppy joes (ditto), and grilled cheese sandwiches. Dad had his own special twist, though. He smeared grape jelly all over the outside of his sandwich. So goofy. So good. But at the time, we were too weirded out to appreciate how good. These days, I get it, and while I don’t eat grilled cheese sammies often, when I do I often include a dose of fruit (usually in the form of apple butter or a sliced pear). The same brilliant man taught me about Breakfast Dessert. See, if you have the discipline to push your bacon to the side and eat your eggs or French toast or whatever first, you can top things off with a bacon-jelly sandwich. The perfect savory-sweet combination to send you off to meet your day. This was all brought to mind by the Concord grapes in my CSA share Monday. They just smell so grapey, you can’t help but be overwhelmed by sense memories of childhood sandwich fillings. With only one quart of fruit, though, there was no chance at a jelly batch. But I figured something out. So this one’s for you, Ted. 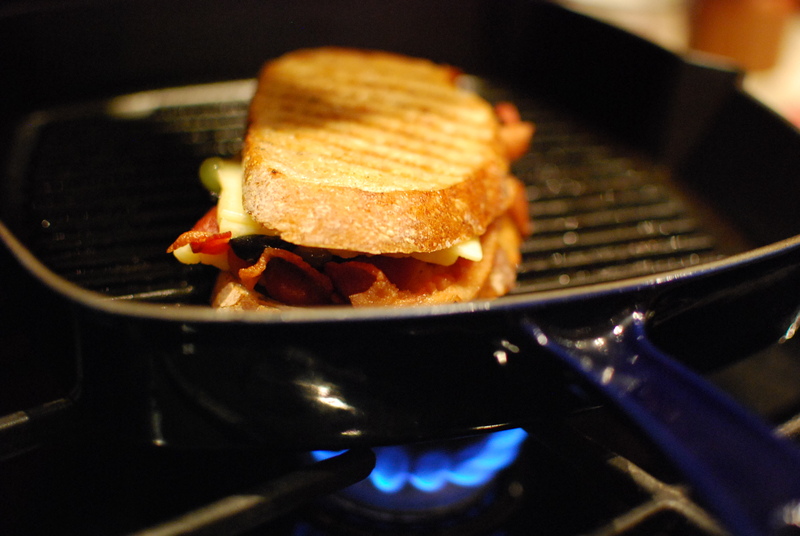 Preheat a panini press, grill pan, or heavy skillet. 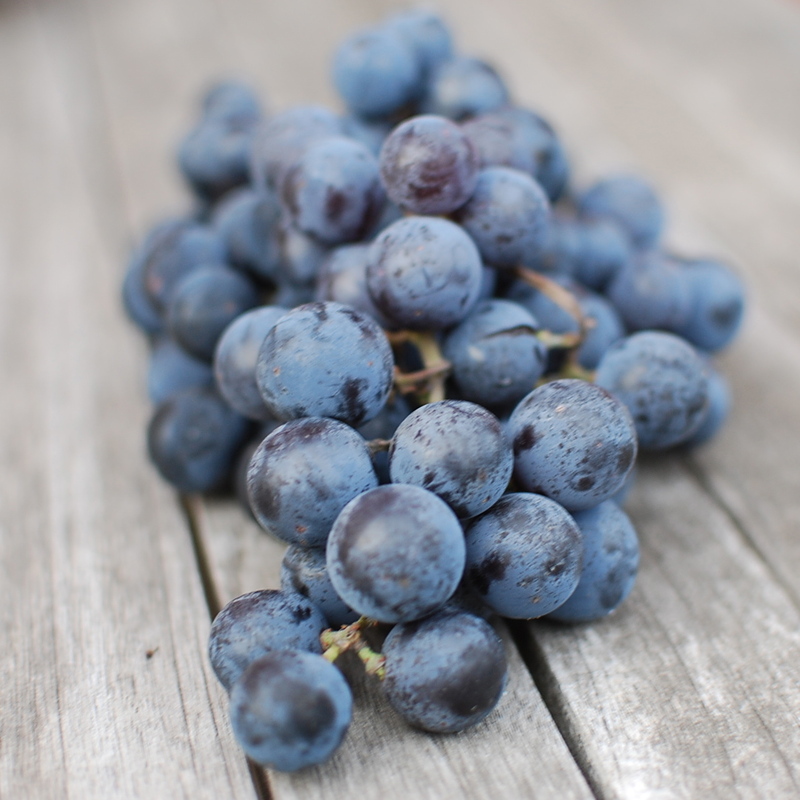 Cut each grape in half, and use the tip of a paring knife to coax out the seeds. 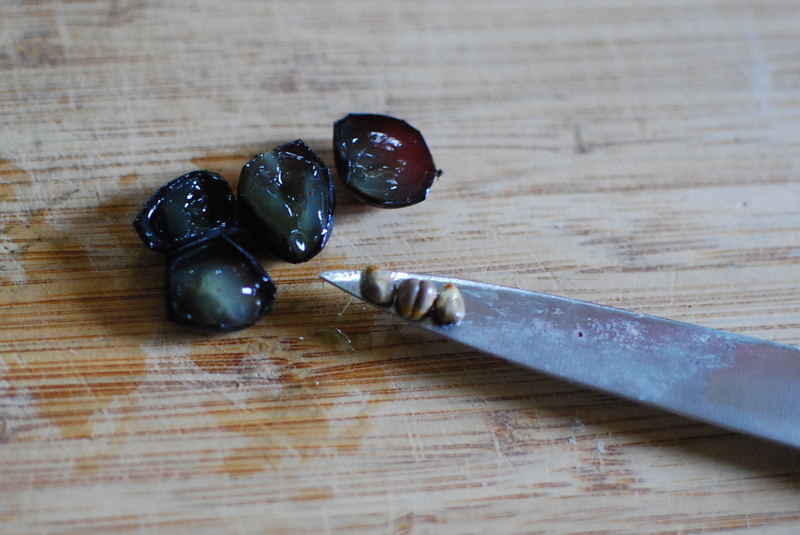 Grape seeds are fine to eat, but take them out if you want (just leave as much flesh as you can). Spread or brush a small amount of butter on one side of each piece of bread. Those’ll face outside. 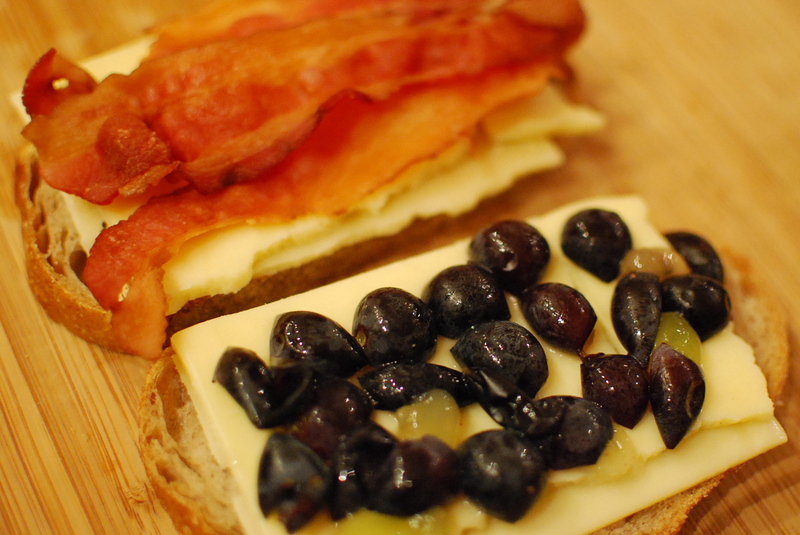 On the inside, layer on the cheese, bacon, greens (if you’re using them), and grapes. Put the halves together. 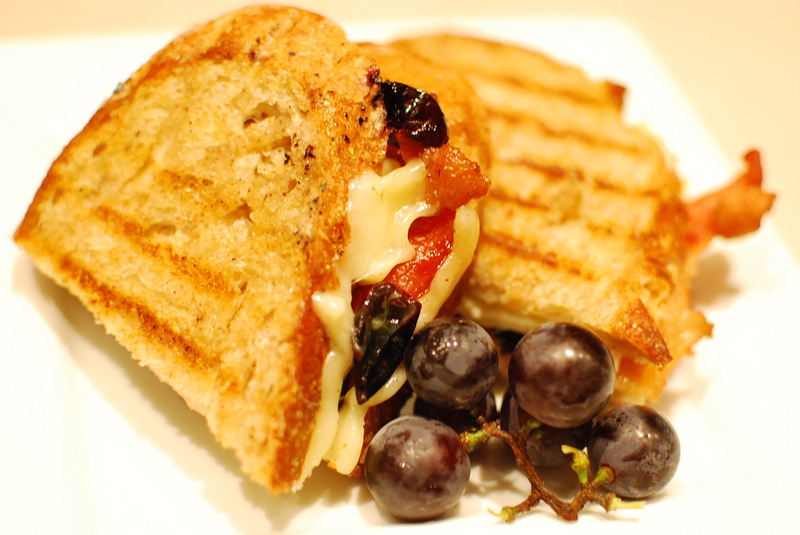 Toast the sandwich for 4-5 minutes a side, pressing down with a heavy spatula or panini press. Let it rest a few minutes before you dig in – the grapes will be very hot. And very grapey. Good call, Dad. Smoosh it down, if you want – or leave it tall and proud. *Yeah, Velveeta, cut from a “loaf.” Hey, don’t get all judgy. It was the ’60s, and processed food reigned. Creamy, melty, gooey, salty. And it came in a two-part box that a genius mom could turn into speed skates that let you glide through the living room’s shag carpeting. Carpeting that was, come to think of it, pretty much the color of melted Pasteurized Prepared Cheese Product. Wish you had paraphrased Twain, did not like”my dad was” . Hope your nephew,Tom, saw this blog. Maybe he will join his brother,Andy, in enjoying a great sandwich. I don’t know if you drink alcohol but if so, concord grapes are the bomb for making infusions. You bruise them slightly and break the skin. Put a bunch in a jar and pour your favorite spirits over them. Let it sit 10 days and it is a gorgeous grape vodka or rum. Thanks, Tammy. I already have two “shrubs” curing away for some cocktail experiments next week. Cheers!